The stock market is a wonderful wealth machine, but mostly for the already-wealthy. Does it deserve a preferential rate? 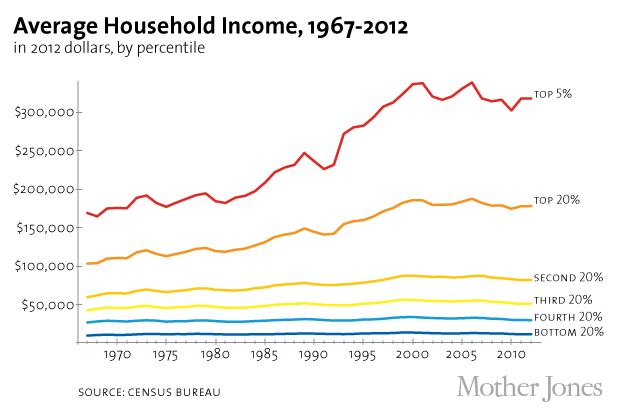 When you break out the income gains since the late 1960s by percentage, here's the picture you get (also, Mother Jones). As real wage growth slowed down for the vast majority of Americans, the richest households not only earned more but also saw higher gains from the stock market, in which they were the majority stakeholders. Interrupting this story with a bit of policy, Republican Sen. Mike Lee has a new tax plan that simplifies the tax code into two brackets and offers extra-generous tax credits to parents with young children. As opposed to other Republican "tax cuts", which used flat taxes to cut taxes for the rich but slightly raised taxes for middle-income Americans, this would actually cut taxes for typical households with kids. But, intriguingly, Lee promises that overall revenue won't diminish. How? In a speech to AEI, he said: "Going forward, I would like to lower rates and simplify the code further; increase the child credit even more; reform the way we tax investments and business income ...."
... reform the way we tax investments and business income? If that's code for "raise taxes on investments," then good. Today, investment income is taxed at a lower, preferential rate. The pro-argument is this encourages investment. One con argument is that the preferential rate gives the rich investor class an unnecessary tax break. In the long run, the stock market is a wonderful wealth machine, but mostly for the already-wealthy. 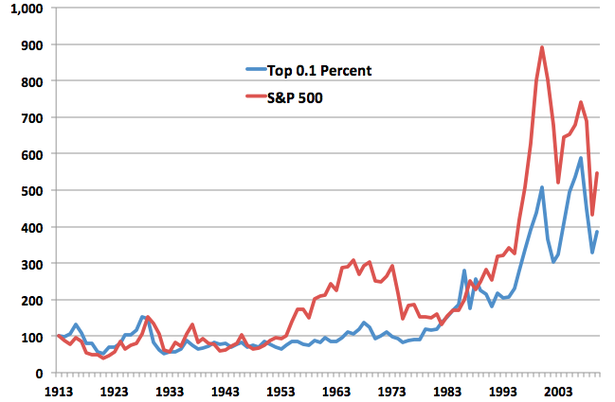 The top 10 percent holds about 80 percent of all stock market wealth. Since the early 1980s, the income of the richest 1000th of the country has been a crazy-mirror reflection of the S&P 500. American workers have had a rough few decades, but multinational companies have found both labor and demand overseas, and the returns to American investors represent the globalization of American business. 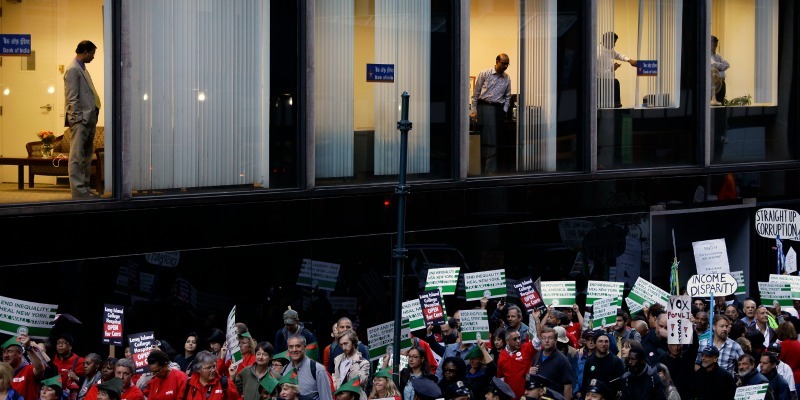 Is this the best income inequality policy? Probably not. Raising taxes on investment income would not, with the wave of a wand, eliminate income inequality. It would not bring back unions. It would not bring back manufacturing jobs. It would neither elongate the workweek nor raise wages. It wouldn't spur innovation. In fairness, it might hurt the financing for new, risky companies that could grow into domestic job-engines. But it's awfully simple and direct. The most important source of income gains for the investor class is, after all, investments. 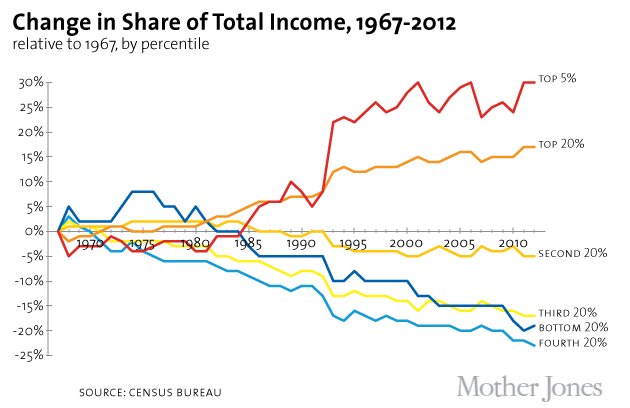 If we want to mitigate, if not quite solve, income inequality, let's start there. It would accomplish something small, but significant: Help Washington keep more low- and middle-income families free of federal income taxes while raising rates on capital gains from global finance and business, which today go almost entirely to the richest sliver of the country.